Everything Beauty and Beyond! 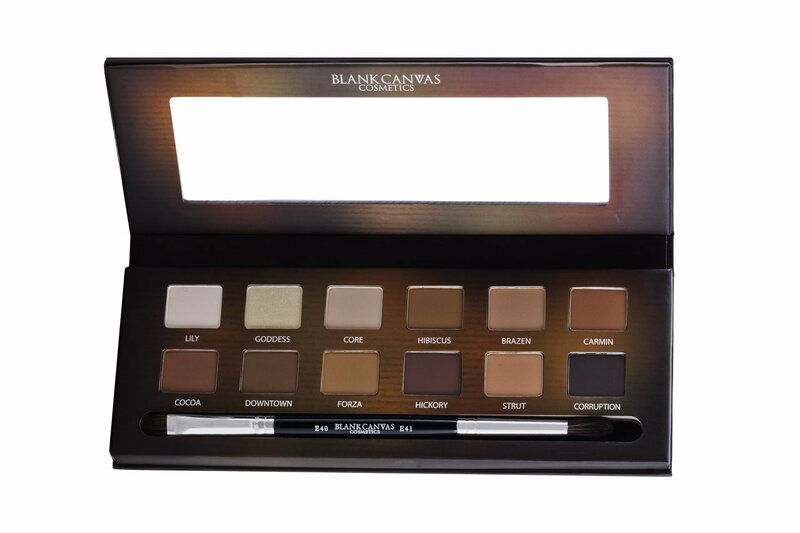 : Blank Canvas Cosmetics Master Series, Palette One! Blank Canvas Cosmetics Master Series, Palette One! As you know by now, Blank Canvas Cosmetics (BCC) is my go to makeup brush company. I literally own all their brushes! I love this company so much, that I also own their makeup. My first purchase ever from them was their contouring and highlighting palette. That was my first ever contouring palette in general. I loved how big the pans were, much product and color payoff it offered and for the price I was totally blown away with their product! This summer they also came out with their Pippa Palette which offered six eyeshadows, a blusher, bronzer and highlighter. Literally an all in one palette. I love those types of palettes because they're great for traveling and take the guess work out of what makeup goes with what because all the colors in the palette work well with each other. For the holiday season, BCC came out with their Master Series, Palette One. When I first saw this palette, I was on the fence only because for some reason the pictures online seemed to wash the colors out so I was unsure of what the hues actually looked like. However, as soon as I saw this palette on their website in its full glory, I knew this palette was for me! The palette comes in a sleek cardboard case with a fully functional mirror and a two sided makeup brush that I couldn't find sold separately on the site. So I think its exclusive to this palette. The brush is nicely nestled at the bottom and it can be used to apply color and blend as well due to its double sided ability. This palette has 11 matte shades and one shimmer shade in a beautiful yellow gold. However the shimmer isn't over the top sparkle which is great. At my age (34) while I love me some shimmer colors, I don't really do sparkle. This palette is very much on the warm tone side. It almost reminds me of the Too Faced Chocolate Bar palettes with its lovely shades of browns. The Master Series, Palette One colors are pigmented, have little fall out, blending amazingly and lasted for hours on my eyes without creasing or fading. The price for this palette is pretty fair. If you consider the average Too Faced and Urban Decay palette starts in the $30 range and goes to $60 and up for their most famous full size palettes; the price is right in the same ball park. Moreover you are getting 12 shades WITH a good quality double sided brush and proper mirror. The shipping on this was about $4.00 and came all the way from Ireland! The country I love the most!! The first three shades (Lily, Goodness, Core) are all light shades great to use for highlighting the inner corner of your eye or as an overall color for the lid to hide any discoloration. Light shades work great for highlighting under the brow bone as well. As mentioned before, Goodness is the only shimmer shade in this palette with a beautiful pale yellow gold that is very pigmented. This baby can also be layered over any of these matte shades for a beautiful satin effect. The next three (Hibisucs, Brazen, Carmin) are in the brown/red family. Carmin especially has a hit of a red undertone which would work beautifully with some eye colors. The lower half (Cocoa, Downtown, Forza) are a darker brown colors with Forza having a peach undertone. The last three (Hickory, Strut, Corruption) are the most interesting of the lot! Hicokory has a purple undertone which is amazing for a purple smokey eye! Strut has a pink undertone that would look awesome in the spring/summer months or if you are going for a romantic look. Finally Corruption. Wow this color totally is my favorite. This hue is not your typical dark black color. While it is black, however it has an undertone of a plum color which is totally beautiful in the daylight. It blends well when used as an outer corner color and had no fallout on my face. Normally black eyeshadow has tons of fallout when applied. But this one totally wowed me! I would highly recommend this palette if you are looking for a beautiful warm tone neutral palette where you can use all the colors and not have 2 or 3 be left out because their functionality in everyday makeup life is not wearable for you. All these colors blend well together and can be worn to any occasion morning, noon and night! As well, BCC hit it out the park with this winner of a palette! Have you tried the new Master Series, Palette One? Tell me what's your favorite shade and tag me in any looks you make with this palette #dayanamromero on IG! Would love to see them!